"What do teachers feel when facing William Shakespeare, tales of family feud, breathless kissing scenes—all in front of a class of teens who are keeping their heads down (and threatening to fall asleep or plot their next prank in the process)? We may never know what our own 8th grade teachers felt. But, on this count, educator Callie Feyen has done us a favor. 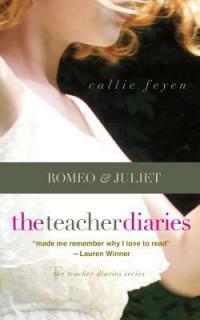 She has written a The Teacher Diaries: Romeo & Juliet. It begins with a kiss. Then, page by page, it reveals her generous, hopeful, and humorous heart. For teachers everywhere, this is a beautiful book to help them remember why they teach. For those of us who just love to get the juicy details of what someone in a challenging position really thinks, this book will satisfy (and sometimes make us laugh, or cry)"--Back cover. A Good Start from a Debut Writer submitted by granumm on August 31, 2018, 9:34am Quick and cute, this account of a teacher's experience is woven with her thoughts on the play itself and how the themes of love, teenage drama, and humor in tragedy appear in her own life. Shakespeare, William, -- 1564-1616 -- Study and teaching. Shakespeare, William, -- 1564-1616 -- Appreciation.